The A Wider Bridge Leadership Transition is Here! We’re excited to announce our leadership transition is complete! After eight years of service, our founder Arthur Slepian has retired as Executive Director, and will remain on our Board. And our former Deputy Director, Tyler Harris Gregory, has been promoted to Executive Director. A Wider Bridge’s planned leadership has just occurred. Founder Arthur Slepian stepped down as Executive Director after eight successful years building bridges, and and is now succeeded in that role by former Deputy Director Tyler Gregory. Arthur Slepian will continue to serve A Wider Bridge as a valued member of the Board of Directors. The AWB Staff and Board have worked diligently over the past eight months to lay the groundwork for the success of this transition. 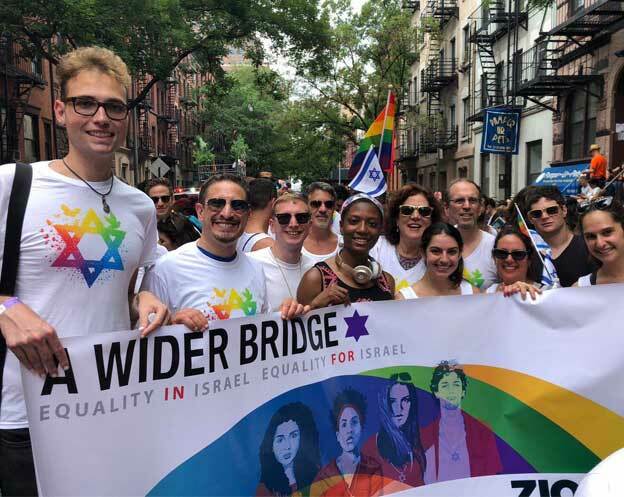 With Shana Gee-Cohen on board as our new National Director of Programs and Development, and a professional team that also includes Quentin Hill, Laurie Grauer, Jordan Schwartz, Ronit Bezalel and Shani Segev, A Wider Bridge is stronger now than ever, at a time when it’s clear that our LGBTQ Israel work has never been more needed. We thank Arthur for his service and welcome Tyler on board!